Nebraska Newspapers « The Falls City tribune. (Falls City, Neb.) 1904-191? The Falls City Tribune was founded in 1904 by Orra R. Ross and Ray C. Walter. The seat of Richardson County, Falls City was located just north of the Big Nemaha River and close to its confluence with the Missouri River. As an important hub of regional commerce, Falls City was a prime location for the politically minded Ross and Walter. The Tribune supported Republican policies. From April 29, 1904, to the end of its run, the paper was published by the Tribune Publishing Company—by Ross and Walter until July 6, 1906, and by E. F. Sharts thereafter. From its first issue on January 8, 1904, to its last on July 14, 1911, the Tribune appeared weekly and had a subscription fee of $1.00 per annum. It focused most of its geographic attention on Richardson County, providing regular reports from nearby towns such as Humboldt, Fargo, Ohio, Barada, Stella, Shubert, Dawson, Verdon, Williamsville, and Rulo. The paper's layout started with four columns with a dated header and page number on pages two through four. 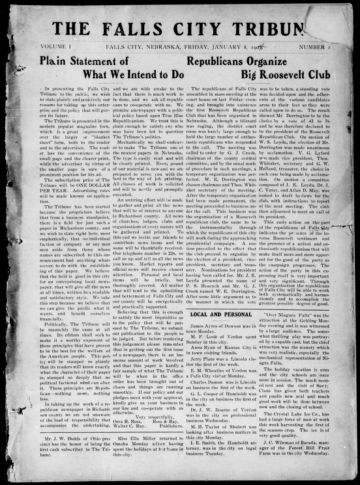 Upon consolidation with the Humboldt Enterprise on June 23, 1905, the format expanded to a six-column layout. By that time, the Tribune boasted a readership of at least two thousand. According to its advertisements in the 1910s, the Falls City Tribune claimed the largest circulation in Richardson County. Ross and Walter were emphatic about the reasons for their publication. Asserting complete independence from local economic and social interests, they explained: "Politically, the Tribune will be staunchly the same at all times. Its editors shall seek to make it a worthy exponent of those principles that have proven to be the best for the welfare of the American people. This policy will be stamped so plainly that its readers will know exactly what the character of their paper is; stamped so deeply that no political factional wind can alter it. These principles are Republican – nothing more, nothing less." Besides reporting on all things Republican, the Tribune had regular columns on regional social events and happenings. Periodic features included "Social Events," "Church News," "Labor and Industry," "Gardening Hints," and "Farm Miscellany." The Tribune featured a simple bold masthead with a subheading that listed the date and issue number. For a string of issues starting on April 22, 1910, a subheading read "Five Consolidations: Falls City Tribune, Humboldt Enterprise, Rulo Record, Crocker's Educational Journal, and Dawson Outlook." This referred to the Tribune's absorption of the Humboldt Enterprise five years earlier and its acquisition of the Rulo Record, Crocker's Educational Journal, and Dawson Outlook in 1910. On April 14, 1911, the paper's format was altered to include a calligraphic masthead with two added text boxes on either side of the title, one listing the local weather forecast, and the other reserved for random editorial headlines.